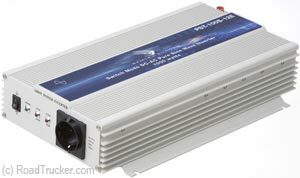 Convert 12 Volt or 24 Volt DC to 1000 Watts of Pure Sine Wave AC Power at 230 Volts with this high efficiency Pure Sine Wave Inverter. This inverter is applicable for service vehicles, telecommunications, recreation vehicles, solar power systems, trucks, and marine. It features switching mode design, low battery alarm / shut down, low idle power draw of less than 1 amps, overload protection, and high output current surge.